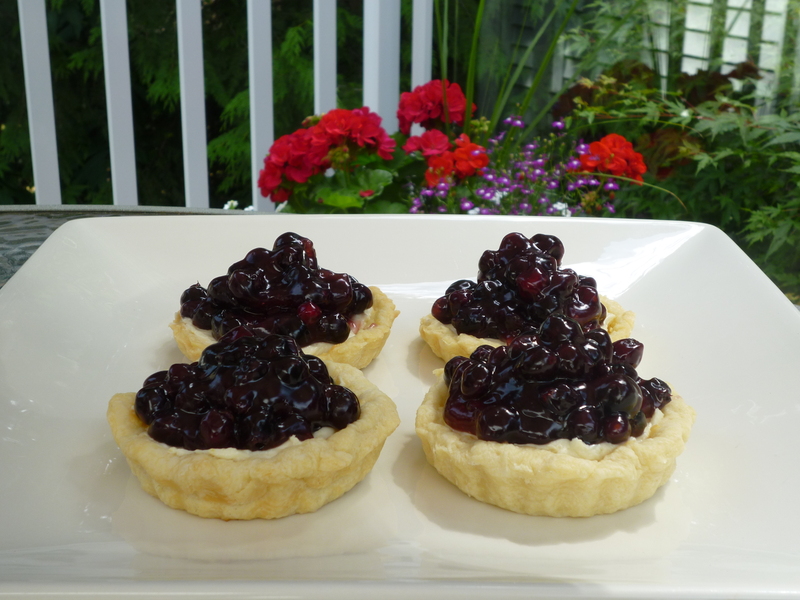 Saskatoon Berry Tarts: Only in Canada, you say? . . . Pity. These Saskatoon Berry tarts made me realize that the Cree people from the Canadian prairies knew a good thing when they found it. Aboriginal people and early settlers in Western Canada have been eating Saskatoon berries (also known as Prairie Berries) for hundreds of years. This berry is believed to have significant antioxidant properties much higher than strawberries or raspberries with anti-cancer, anti-aging and anti-heart problem benefits, helping to guard our immune systems. They are significantly higher in protein, fat, fibre, calcium, magnesium, manganese, barium, and aluminum than blueberries. Hmmm . . . combining them with sugar and fat in this recipe probably negates some of those benefits, but these tarts sure taste good! Here is another recipe from the Saskatoon Berry Farm in Cobble Hill, BC. I’ve adapted this a little from the original recipe. Fills 12 baked tart shells, or 8 four-inch individual tart pans. 1. Put flour and salt in food processor and pulse. 2. Cube butter, then add to flour in processor bowl and pulse till it resembles coarse meal. 3. Add vinegar to milk. Add all at once to flour mixture. Pulse until it just forms a ball. 4. Remove and divide into two balls. Place on waxed paper or plastic wrap, flatten gently into a disc, top with another layer of wrap, fold over and refrigerate if not using right away. This is a reliable recipe that is true to its name. Read how to pre-bake a pie shell here. Blend together all ingredients. cover bottom of each tart shell with the cream cheese mixture. 1. Crush 1 cup of berries and place in small saucepan with water. Simmer about two minutes. 2. Strain and return Saskatoon berry juice to saucepan. Combine sugar and cornstarch and add to sauce. Cook over low heat, stirring constantly until mixture is thick and clear. 3. Stir in liqueur. Add remaining 2 cups of Saskatoons to glaze and stir gently. 4. Cool, then fill tarts. Garnish with a dollop of whipped cream if you think you need more calories. Like what you see here? Subscribe to my new blog, Flavour and Savour and never miss a recipe. “Like” my Facebook page here. Thanks! This entry was posted in desserts and tagged cream cheese, Gran Marnier, lemon, never fail pastry, pie, Saskatoon berries, tart. Bookmark the permalink. 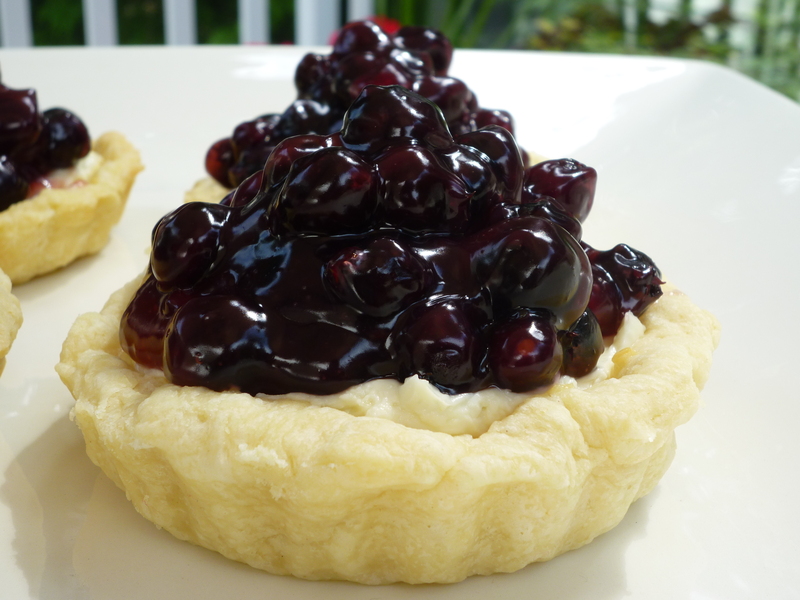 9 Responses to Saskatoon Berry Tarts: Only in Canada, you say? . . . Pity. Actually, I just read somewhere that there’s a farm in france that grows saskatoon berries. They grow wild around Grande Prairie by the thousands. There were bushes right out back of our house in town. Also, there is Saskatoon Lake with a wonderful campground and Farrah and Brian were camping there right among ALL saskatoon bushes. The grandchildren and I were picking and eating,, fun times. Lucky you! Did you cook with them at all? We also discovered this fall that they grow wild around Quamichan Lake, right near where George used to live. They were good but not as tender as the farmed ones. they grow wild throughout all the prairie provinces, I live in Sylvan Lake and wild Saskatoons grow everywhere in town if people will let them. I have them all around me yard. Since I posted this, I’ve found lots growing wild just near my new home here. Do you have a favourite recipe for them? I’m glad you liked the tarts! I like Saskatoons because they’re so different from other berries. You’re expecting them to be sweet like blueberries, but they’re a little more subtle in flavour. It’s a short season for them here, so I make the most of it while they’re available.